Islington Somali Forum is launching their inaugural conference on Knife Crime, County Lines and Criminal Activity among Somali Youth. In attendance will be: parents, victims of crime, young people, and representatives from the police force, voluntary sector and statutory bodies, as well as youth offending teams. This conference will be an opportunity for everyone concerned to voice their views on how we can tackle knife crime. Book here. The BoardMatch event is back and for the first time its being brought from East London to the borough of Islington. This is your opportunity to present your trustee needs directly to 70-80 interested employees of over 30 City and Canary Wharf based companies. In the week prior to the event at Macquarie Group their volunteers will be hosting a pitching skills session to help you hone the promotion of your vacancies. Following the event, BIG Alliance staff will support you in coordinating the applicants and inviting to interview the employees who you’d like to join your board. From the last event in October one charity gained as many as 3 new trustees. Please contact tom.browne@thebigalliance.org.uk for more information or to reserve a space for your organisation by Monday 28th January. 7th Feb, 12 – 3pm. Islington Town Hall, Committee rooms 1, 2 and 3, Upper Street. 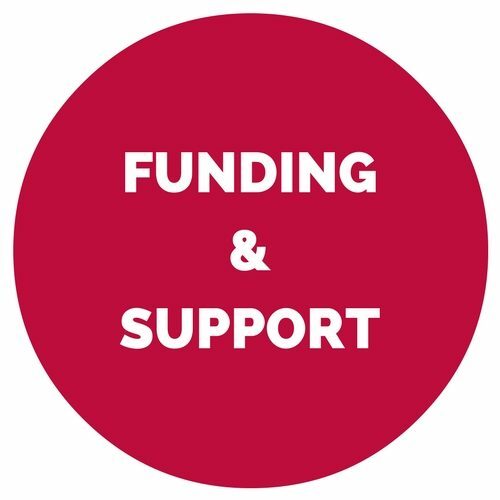 This free workshop organised by 4in10: London’s Child Poverty Network is been designed to help organisations to understand the different types of funding applications, how to research and select the right ones for your organisation and write effective bids. The workshop is aimed at VCS organisations in London, with funding opportunities focused on those working on issues of tackling poverty and supporting children and young people in London. Click here to register. 15th Feb, 9.30am – 4pm. Soapbox Youth Centre, 69-85 Old St, London, EC1V 9HX. This CPD-certified training course is targeted towards youth justice practitioners and aims to enhance awareness of unconscious bias within the context of racial disproportionality and overrepresentation of young BAME people within the criminal justice system. The training is intended to increase understanding of this complex issue and explore strategies and techniques to reduce the potential for UB to adversely impact upon practice. More info and registration here. Galbur Foundation in partnership with Islington Council present organised a day filled with local young people, parents and carers at Islington Town Hall to discuss what Mental Health and Youth Crime means to them! This is free service but you need to register on Eventbrite as the numbers are limited. More info and registration here. Our colleagues at Single Homeless Project gathered a daily list of free and affordable food options for Islington residents, it also includes alternatives to food banks in case people exceed permitted number of referrals. Click here to download the list of free food banks which will be helpful for clients who may be struggling over the festive season and afterwards. 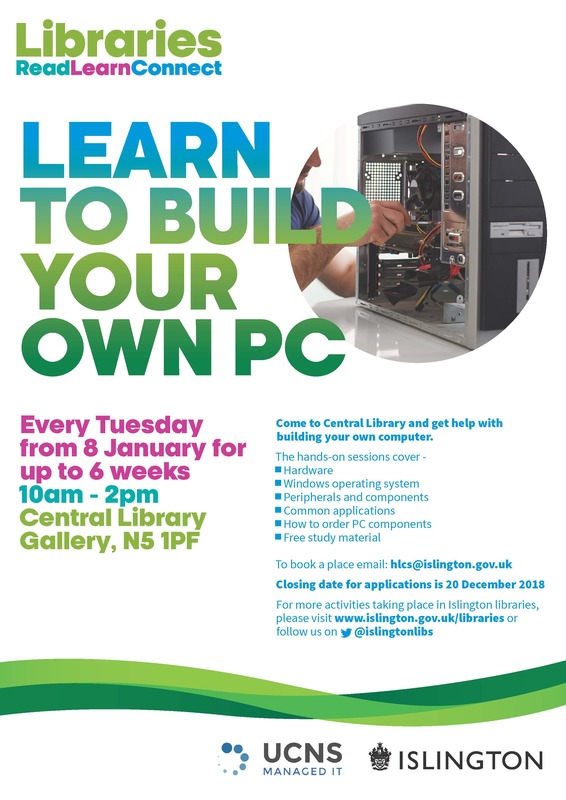 Islington libraries organise the “Learn to build your own PC” sessions every Tuesday from 8th January for up to 6 weeks from 10am to 2pm at the Central Library. Check out the leaflet for more information. Applications for the 2019 Community Resourcing (CoRe) programme organised by The BIG Alliance, Islington Giving, Macquarie Group and Slaughter and May are now open! • Focused on supporting your organisations’ key objectives, often providing resource to complete work that wouldn’t otherwise have been possible. For further information download the CoRe 2018 programme report. Email tom.browne@thebigalliance.org.uk by Wednesday 30th January if you would be interested in joining this year’s 2019 programme. IPR KidsSupport provides a specific dedicated service for Islington families with children with disabilities or long term health conditions, focussing on welfare benefits. It can assist with DLA Child Applications, Appeals, Tax credits and other matters that would assist such families. It includes appointments at their main offices at the Manor Gardens Centre in Holloway. They already have existing demand from families with children with Attention Deficit Hyperactivity Disorder, as well as autism. They are linking with organisations locally to ensure that families with children who have learning difficulties, autism and physical disabilities, can access the service. Islington CCG wants to hear residents views on the Islington Walk-In Centre service – help them understand how to provide better same-day access. The overarching goal to which Islington CCG is committed is to increase access and to provide high quality primary care services to the people of Islington. To find out more and share your views, please click here. Get Set are running a financial wellbeing course for parents of primary school children who live, work, study or worship in Islington. The 4-week course consists of group workshops and individual coaching support. There is also access to a suite of online activities and games for children to get involved at home. The next course is starts on Friday 1st February, 10am – 12pm. Please have a look at the leaflet for more details. Media Trust’s launched the new online Resource Hub last month. The Hub will bring organisations the latest digital marketing and communications resources, tips and advice, on a broad range of topics from strategy and building online audiences to social media and SEO. You will find insights from charity peers as well as tools and tips from the media and tech giants that are shaping the way we market and communicate in today’s rapidly evolving digital world. Voluntary Arts launched a new interactive Creativity Map designed to help increase the visibility of creative groups and regular activities across the UK and Republic of Ireland. Creative groups can use it to promote their organisation and find new members in their vicinity. Make the contribution your organisation is making to the Islington cultural life more visible, add your group! • Information Commissioners Office (ICO) 12 Steps to take now and Getting ready for the GDPR, Advice service for small organisations. • White Fuse data protection policy template. Henry Smith Charity launched an “Improving Lives” Grant programme to charitable organisations, social enterprises and constituted charitable groups to help people in the UK when other sources of support have failed, are inappropriate, or are simply not available. Grant size: between £20k – £60k per year during a period of 3 years. There is no deadline for applications. For further information and how to apply here. Ibrahim Foundation gives grants to organisations which aim to improve the quality of life for people and communities in the UK, both now and in the future. They like to consider work where others may find hard to fund, perhaps because it breaks new ground, appears too risky, requires core funding, or needs a more unusual form of financial help such as a loan. Check out more information here. Dickie Bird Foundation Fund is now open for local groups which assist young people under 16 years of age to participate, to the best of their ability, in the sport of their choice irrespective of their social circumstances, culture or ethnicity and to ensure that, in doing so, they improve their chances both inside and outside sport. The grants are payable to disadvantaged children aged under 16 for essential sports equipment. Travel or coaching are not payable. Payment is for individuals therefore teams/groups should not apply. More information here. The Screwfix Foundation is a new charity set up by Screwfix in 2013. It has a clear purpose of raising funds to support projects that will fix, repair, maintain and improve properties and community facilities specifically for those in need in the UK. The Percy Bilton Charity is a grant-making trust. Grants are made to organisations and individuals in need throughout the U.K. Organisations assisting disadvantaged youth, people with disabilities and older people may apply for grants towards capital expenditure. Social workers may apply on the behalf of individuals who have a disability or mental health problem, or who are over 65, for grants to purchase basic furniture, equipment and clothing. Voluntary Action Islington have produced a specific funding booklet for Arts & Culture Projects. Some application for grants will be closed in early February, make sure that you would not miss the deadline by checking our funding booklet! You can find more information about these and other funding opportunities in the June 2018 Voluntary Action Islington Funding booklet. Islington Council joined the nationwide SUGAR SMART campaign that aims to encourage people to reduce the amount of sugar they consume in an effort to tackle serious health conditions. SUGAR SMART Islington is a campaign that supports local businesses, schools, children’s centres, sports / leisure centres, workplaces, hospitals and community organisations to promote heathier, low-sugar alternatives and to limit less healthy food and drink choices. 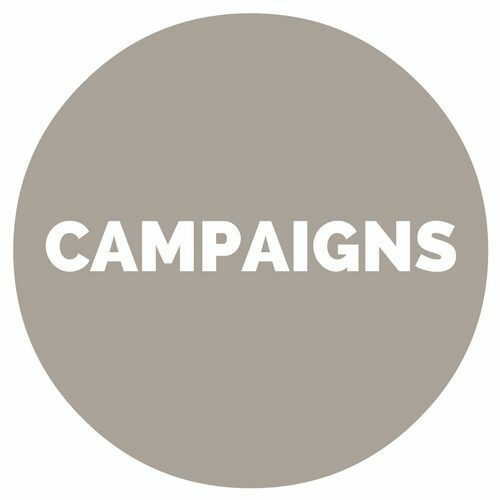 Any local business, organisation or employer can sign up to the campaign on the SUGAR SMART website. There are lots of suggestions for actions that help people to reduction their sugar intake, or you can come up with your own innovative idea and email that to Julie Edgecombe. The Charity Commission has launched a consultation to seek views on how best to reform the process for developing the Statement of Recommended Practice (SORP), and to make recommendations for any necessary changes to ensure the SORP remains fit for the future. The closing date for comments is Monday 4th February. After the Transforming Mental Health Services in Camden and Islington consultation, Camden and Islington CCGs met on 20th December as a Governing Body in common to make a decision on the proposals in the consultation. The responses from the public and key stakeholders were presented at this meeting in an evaluation report along with detailed information on how the points raised in this report and as part of the consultation will be addressed (in a Decision Making Business Case). The Governing Bodies agreed the proposals. 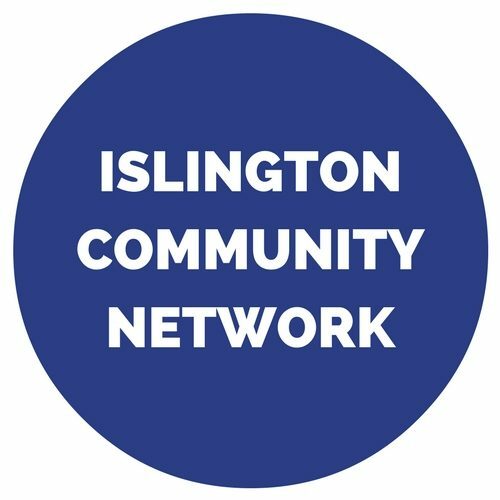 Islington Clinical Commissioning Group’s website explains in full the next steps now the proposals have been agreed along with the evaluation report and how the recommendations from the local community will be addressed. If you’re interested in being involved in the next steps of the engagement for both the inpatient unit and the community hubs please email: islington.ccg@nhs.net or call 020 3688 2900. Charity Digital has compiled some useful statistics from 2018, drawing on research from the Charities Aid Foundation, the Directory of Social Change, Salesforce and more. The information covers the changing donor landscape, the battle to do more with less and the endless opportunities that technology offers. Voluntary Arts published the results from their survey of creative participation ‘Big Conversation 2018’. The survey highlights the huge contribution that the voluntary and amateur creative sector makes to addressing one of the most pressing public policy challenges: that of loneliness and social isolation.